If you notice a discrepancy in any of your reports, you can use the following steps to troubleshoot these. For this case example, we’re going to use Taxable Sales being higher than Net Sales. 1. Figure out which tax ID belongs to which department. You can do this by going to Setup -> Taxes, selecting a tax and clicking the “Edit” button. 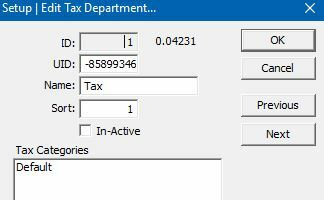 This screen will show you what ID belongs to this Tax. The tax in the picture below has an ID of “1”. You will need to know which Tax Department has which ID for all Tax departments you are altering. The “Tax” tax has an ID of 1. 2. After mapping out each tax to its ID, we can navigate to Merchandise -> Modify Merchandise. 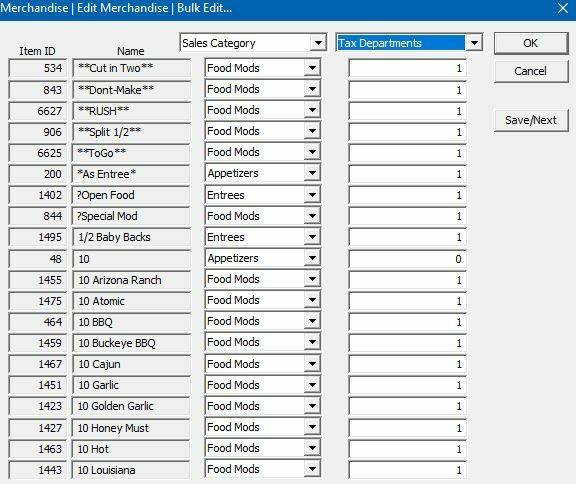 If you are having a discrepancy in one department, you can sort items by Department by selecting “Department” in the drop-down menu at the top left of this screen. If you are unsure of where the discrepancy lies, you can select “None” in this drop-down, which will show you every active item in your system on the right-hand side. 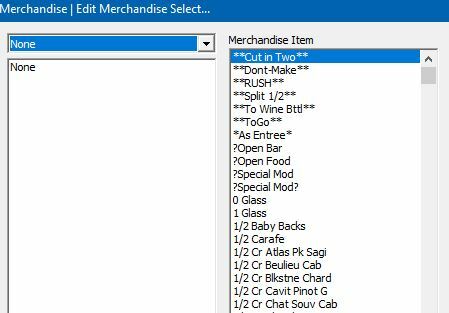 Selecting the “None” item in the dropdown shows all active menu items. Selecting which fields we are wanting to see or change in Bulk Edit. 5. Once you are ready to move on to the next page of items, you can click the Save/Next button to save any changed information on the current page and move to the next page. Repeat this process until you have changed all the information you find incorrect. If these instructions do not resolve the discrepancy, please give us a call at 1-877-594-8767.